It’s easy to forget after the flurry of activity that has filled the past couple weeks, including a trade that brought Mike Morse to Seattle and John Jaso to future free agent purgatory, a signing of Kelly Shoppach, a signing of Felix Hernandez to an extension, a signing of Joe Saunders, and a potential hiccup in the Felix extension, that at one time, the Mariners were in on everybody. It really didn’t matter, pitcher or hitter. The Mariners were in on everybody. It became frustrating when they seemed inactive and even more frustrating when they were rumored to be in on Michael Bourn. Bourn was worth 6.4 WAR last year, and more than four wins in each of the previous three seasons, but so much of it was based on average-ish hitting and elite defense and baserunning ability that Mariners fans saw the two reasonable outcomes of Bourn as either Chone Figgins or Franklin Gutierrez. Gutierrez may be healthy this year, and he may not be, but even if he loses a limb in preseason the Mariners have Michael Saunders on the roster. Saunders played an average center field last year while hitting above average also. But as Bourn’s free agency extended into February, he looked like he may have to settle for something like a one-year deal, and the Mariners rumors persisted. If they’d signed him they’d have given up their first round pick. If they signed Bourn for the four years, $48 million he signed for in Cleveland they’d have had a second chance to see how a no-power, good defense, high-speed skill set aged, but in the case of Bourn, they’d have to watch him strikeout a fair amount also. Bourn is better than Saunders and healthier than Gutierrez, but he’s not so much better that the questions about how he’ll age and how that influences both his offense and defense warranted paying significant money for him, as well as a first round pick. 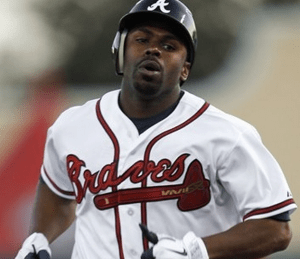 Michael Bourn is not coming to Seattle!! 2nd best news of the off-season, after the nixed Justin Upton trade. I am breathing easier now. I’d wedge no Hamilton at crazy money into that order. If for no other reason than it will shut up Geoff Baker I’m glad to see this move. Glad for the Indians too, they are showing what teams can do with the increased national media money. Their’s will just about cover the cost of Bourne and Swisher together after this season. (The Indians owner also sold their regional Sports Time Ohio network to Fox for a reported $230MM in December and increased the team’s TV contract to $40MM, up by $8MM.) The M’s can boost their payroll by over $30MM next year with their new national media money and Figgin’s $8MM finally off of the books; plus an additional $7MM if they don’t pick up Guti’s option. They can keep one or both of the M&Ms (Morales and Morse) if they produce and still sign just about any free agent they want. They will find out who the keepers and sleepers are this season and then fill in the holes. I agree. I think they’ll be better this year, but they will have SOO much flexibility next offseason.